The January 2017 departure of Richard Bridie divided opinion amongst York City supporters. Top scorer at the time of his departure, when we were struggling to score, many were dismayed at his release, equal numbers felt he’d had his chance and blown it. His return in May 2016 surprised many as he’d been struggling at Conference North level. By the start of the season, he was struggling to lost e weight and never felt he didn't look like a professional footballer. However, he had a purple patch, scoring in 5 consecutive games before losing form as City slumped. The nomadic marksman enjoyed a remarkable and eventful three-and-half years with the club following his arrival from non league side Newcastle Benfield Bay Plastics for a nominal fee paid by then manager Billy McEwan in January 2007 after he impressed in an FA Cup tie against City. Brodie scrambled a goal just a couple of minutes into his debut after coming off the bench in a 4-0 triumph at Altrincham. But he was then sent-off when featuring for the reserves against Scarborough in the North Riding Senior Cup, although the likeable Geordie had clearly shown enough to have his deal extended at the end of the campaign despite being restricted to just three starts and eleven substitute appearances. The following season Brodie was rather in and out of the side but still helped them towards a new club record of six successive away wins. Those included him coming off the bench to incredibly score twice during injury-time and complete a highly dramatic 4-3 victory at Droylesden on New Year's Day. That prompted excitable BBC Radio York commentator Barry Parker to demand an immediate statue be built in his honour! Brodie finished with 14 goals in his first full season despite around half of his 48 appearances being as a substitute. It did though result in another contract extension. Always an unpredictable maverick, Brodie didn't exactly enjoy a particularly good start to his next campaign when being sent-off after coming on as a substitute at Wrexham. This helped to cement his reputation for being hot headed that had seen him become the first City player to be sent off as a substitute, against Grays in September 2007 when he was ordered off on 74 minutes having been introduced 53 minutes earlier. He was subsequently farmed out on loan to Barrow and appropriately scored twice on his debut against Tamworth in an FA Cup fourth qualifying round tie. He totalled four goals in seven appearances whilst with the Cumbrians. His return to York importantly coincided with the arrival of Martin Foyle as manager and a new beginning with City. Brodie began to really discover his immense goalscoring potential, while in the process helping them towards an FA Trophy final appearance against Stevenage at Wembley. He also crucially netted in a 2-1 success at Weymouth late in the season as York narrowly avoided relegation - and eventually finished top scorer with nineteen goals in 46 appearances. Rewarded with a two-year contract in June 2009, an absolute avalanche of goals then followed from the always ultra direct hit-man; including his first-hat-trick for the club in a 3-2 win against Chester City - although it was to be expunged from the records due to Chester resigning from the league. Brodie was having none of it though and later commented: "Forty goals would be brilliant. I'm on 36 as I'm including the goals against Chester because I scored them". Only twice in City’s history has a player scored more goals in a season. Undeterred the big centre-forward had already raised his individual tally for the season to twenty in a 2-1 victory over Wrexham - that result equalling the club record of eight successive victories in all competitions. He also broke the club record for reaching twenty goals in a season in the fastest time, beating the legendary 'Happy Wanderer' Arthur Bottom by six days. Brodie's explosion of goals continued with his second hat-trick in a 3-1 victory at home to Hinckley United in the FA Trophy. They were often spectacular efforts struck with his lethal left foot, and it should also be recalled he was a regular provider to others while always capable of winning penalties, such was his uncompromising style. His sensational exploits not surprisingly made him a wanted man, initially the likes of Gateshead and Barrow but then rising in profile to such as Grimsby Town and Peterborough United - although their director of football Barry Fry made a point of denying it despite manager Mark Cooper's regular vigils. There was a suspension for a tenth yellow card and soon yet another ban for a stupid sending off at Ebbsfleet. Chester's unfortunate demise suddenly witnessed his prized goal-tally reduced from 27 to 24. 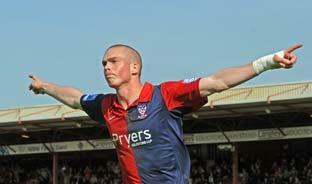 He then saw a penalty saved at Mansfield after directing his spot-kick to exactly the same side as his previous six. Brodie still ended a rare barren spell with a brace at Grays Athletic and then blasted a first-half hat-trick against Wimbledon as the home side totally ran riot. He went on to be named as Players' Player of the Year and also collected the Keith Walwyn Golden Boot for being top scorer having already surpassed the 30-goal mark. Brodie included a famous last-minute winner in a play-off semi-final first-leg 1-0 victory against Luton Town at Bootham Crescent. York also won the return by the same scoreline before heartbreakingly losing the final 3-1 to Oxford United at Wembley. Brodie still finished the season with an incredible 34 goals in 51 appearances but a rejected £125,000 bid from Crawley Town in the summer appeared to affect him at the start of the following campaign. He was though eventually to join Crawley for a record fee between non-league clubs of around £300,000 at the end of August, just three minutes before the transfer deadline. "Leaving York City is one of the most emotional decisions I have ever had to make; I have spent many years at the club and it will always have a place in my heart," Brodie commented. "I would like to put on record a special thank you to the York City faithful who have always been there for me, rain or shine. I'm 23 now and I've got to stand on my own two feet and fend for myself a little bit as they say". However, the home-loving north-east boy who once told supporters his only hobby was watching TV soap Coronation Street because he didn't know how to use a computer, never properly settled in the deepest south of West Sussex: "Everything is totally new as I was at home with my mam when I was at York," he said. "It's a totally different culture and a lot more expensive as well - it's £3.60 a pint or something like that!". Knowing the price of a pint was telling. Certainly rumours suggested that he was unhappy down south. Brodie was later only denied an equalising goal by the woodwork in an FA Cup tie at Manchester United, and also netted on his return to Bootham Crescent for his next club Fleetwood. He reacted: "To score a goal at that ground, it couldn't have been a better day for me especially scoring it in front of my Nan and Granddad". His grandparents had played a large part in his upbringing. Their values certainly rubbed off on Richard, who if you ever speak to him will come across as one the kindest and nicest people you’ll ever meet. But his career then went into a steep decline with a succession of temporary loan moves and low profile permanent spells, including at hometown club Gateshead (bombed out by Gary Mills about 10 days after he arrived); although he at least managed a reasonable goal-return while playing for Southport during 2014-15. He started the 2015/6 campaign with Aldershot but went on to finish it by appearing part-time with National League North outfit Stockport, scoring four times in thirteen games in all competitions, while typically being booked in all four of his league appearances. Such was the enigma of Richard Brodie, the 'Angel of the North'; who himself was just like an ordinary fan; a 'big daft lad' who comically once headed towards the opposition dressing room by mistake at half-time; though who was never really the same player without his beloved York City badge closest to his massive heart. In 2016, he fine early season form on his return to City came to an end in a spate of bookings and an early season ban after picking up 5 bookings. Within days of leaving City, he joined Boston. It can be only hoped that they see the best of Ricard Brodie and his goalscoring exploits. A whole hearted player, he could never be accused of not trying on the pitch.